– Hiram Bingham, Lost City of the Incas. These were the words of American archaeologist Hiram who discovered the existence of the great Inca Empire. The secret which was only known to some locals in the said region opened up to the word, was recognized as a wonder of the world and most importantly became a part of the bucket list of places of travel, for millions. 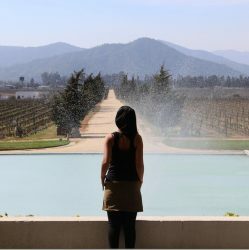 It was never a part of my bucket list, but the moment Rony proposed South America as a travel destination I was sure we have to visit it. 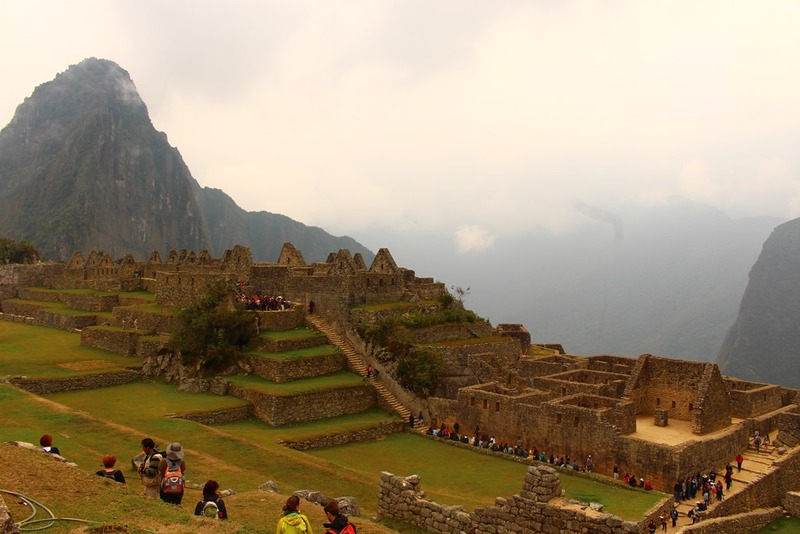 Most tourists go to Peru to visit Machu Picchu. So did we. But after having done the trip, we can assure you that there is much more to Peru than Machu Picchu. Machu Picchu is indeed beautiful, breath-taking and mystical. 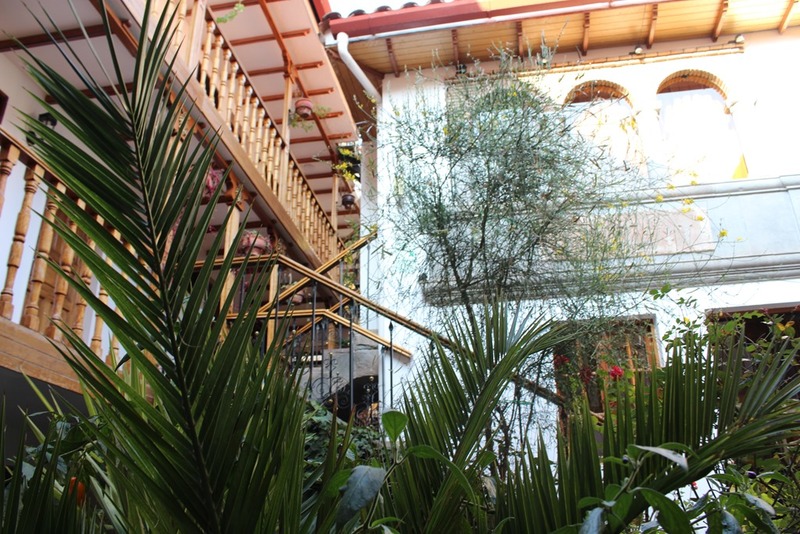 But every other place we stayed which includes Lima and Cusco had something to offer. From the very beginning we were very clear that we do not want to do any of the Inca trail treks. There are a number of packages which allows you to trek from varying points. The number of days it takes to reach Machu Picchu could range from 7 days to 1 day. The most picturesque one according to may websites is the classic 4-day Inca Trail trek that starts at km82 – 82 kilometres along the railway from Cusco to Aguas Calientes. Considering only a limited number of tickets are issued to visit Machu Picchu every year, the first thing we did is to book the same. It was a tough job to find the official site, considering there are hundreds of websites online. Once we found the right one, we were disappointed that we could not get the tickets to climb Huayna Picchu– the mountain which we see in the back ground in all the post cards. We had to be content with tickets for Machu Picchu and Montana. Rony, who booked these tickets, two months in advance was surprised to see the hike to Huayna Picchu booked till February next year. We were a bit disappointed then. But in retrospect we don’t regret it. My stamina clearly would not have let me climb Huayna Picchu. 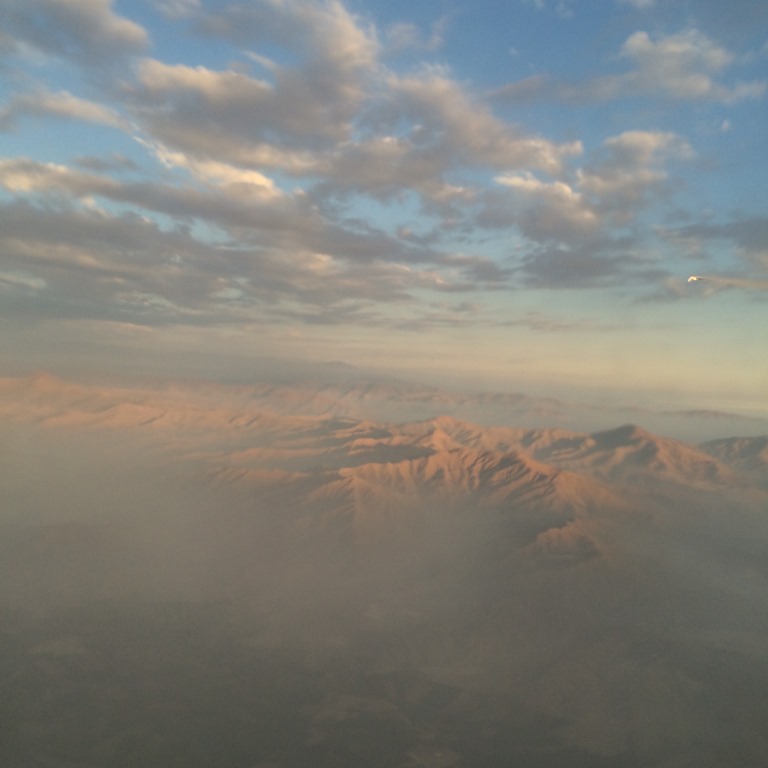 Once we had the tickets to Machu Picchu, we sort of worked backwards and booked our stay in Lima, Cusco and Machu Picchu along with the flight to Cusco and train tickets to Machu Picchu. Once the tickets to Machu Picchu were booked, we had to figure out how to get there – which was the most difficult part. Considering we were landing in Lima, we decided to say there for 2 days. This was a great idea since we did take some take to get over the jet lag. We also managed to meet up with the husband’s friends and do a bit of shopping. 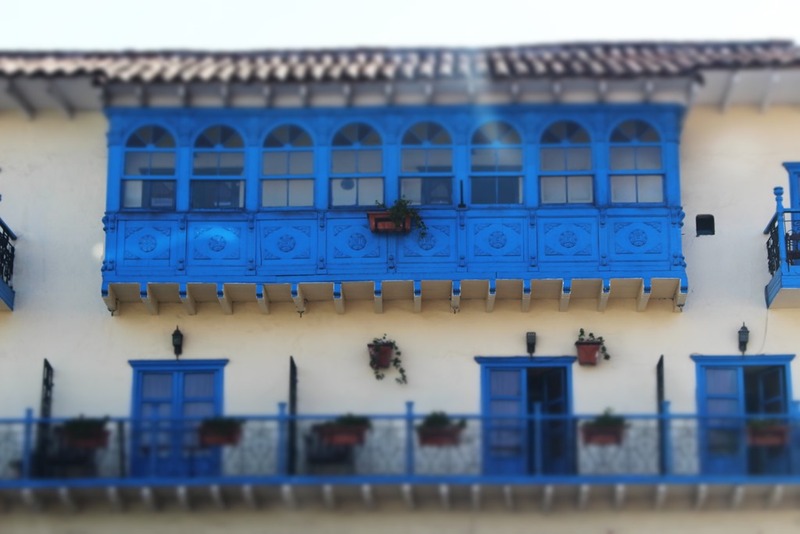 Upon a great deal of research on the internet, we found that Miraflores was one of the best places to stay in Lima. The basic requirements for a hotel for us was it should have free wifi, airport pickup, centrally located and below 100 USD. Colon Hotel at Miraflores met all our requirements and hence we booked it. We liked the hotel, but would have liked if it was a little more luxurious for the price we paid. No complaints about the service and 100 marks for its location. It was at a walk able distance from the market, Larcomar (the famous shopping centre) and restaurants. The shopping we did at Mercado Central got me smiling when I saw the prices of the same items at Cusco, Aguas Calientes or at the airport. 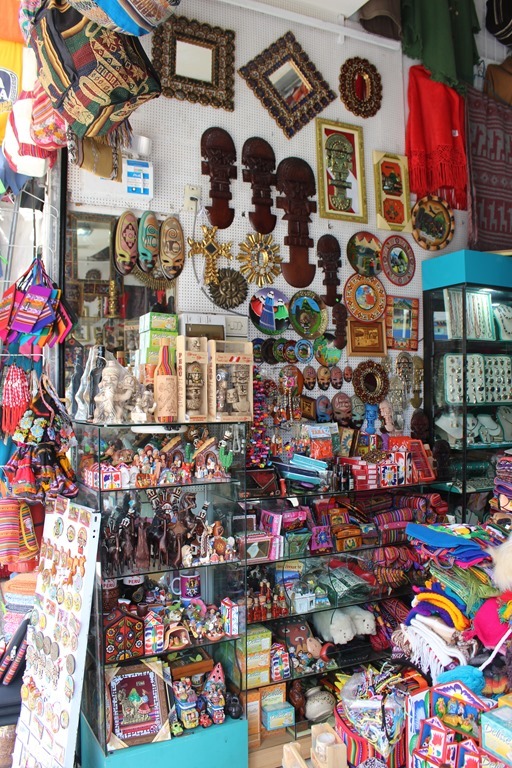 The Peruvian nativity scene, postcards, ponchos, fridge magnets , jewellery, paintings were all way more cheaper in Lima than in any other place Peru. Some pictures we clicked while shopping! 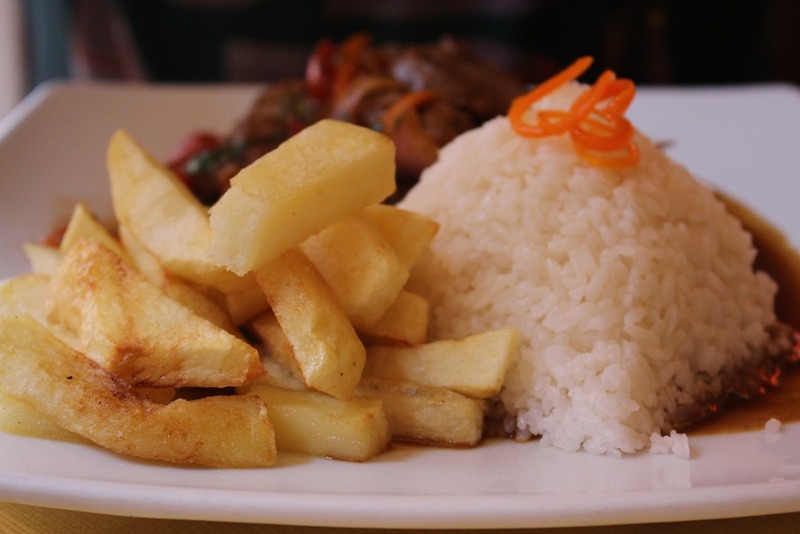 The best find of the trip according Rony was the Lomo Salltado.This dish is a typical Peruvian dish made of marinated steak, vegetables, & fried potatoes served over rice. For a Malayalee Christian, its rice and beef. It is indeed on one of the best dishes I have had too. 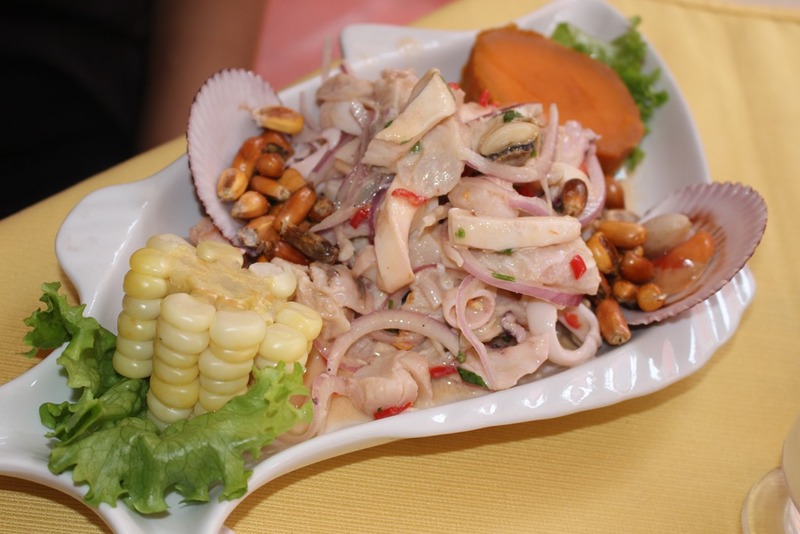 We also loved the Peruvian Ceviche. In fact any dish consisting of beef or fish couldn’t go wrong for the simple reason that it was fresh! The fact that they used a lot of onions to any dish appealed to me since I love onions in any form. 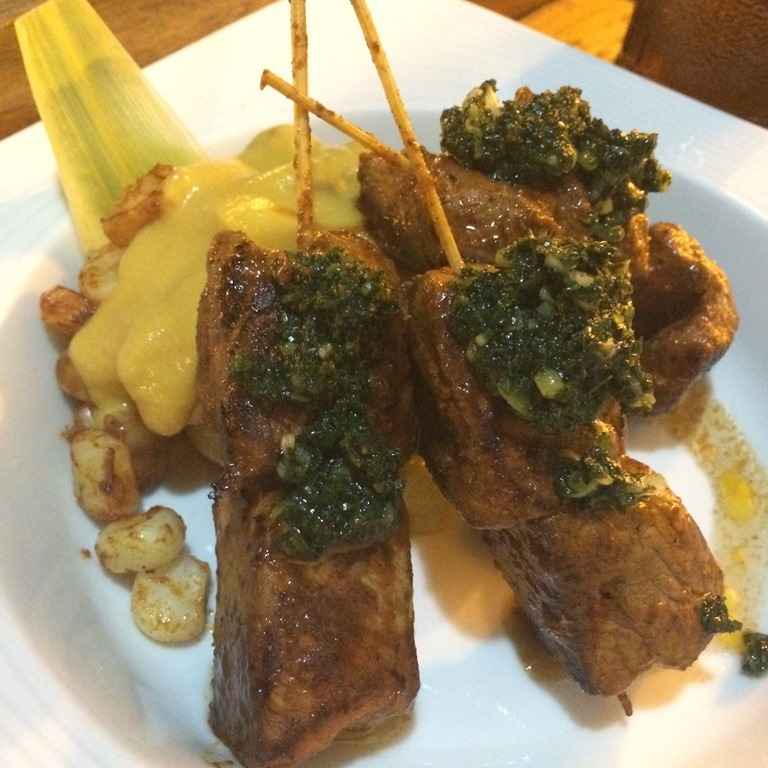 Peru, also has a lot of fusion cuisine. The husband’s friends took us to this restaurant which had Peruvian Italian cuisine. We totally loved it. 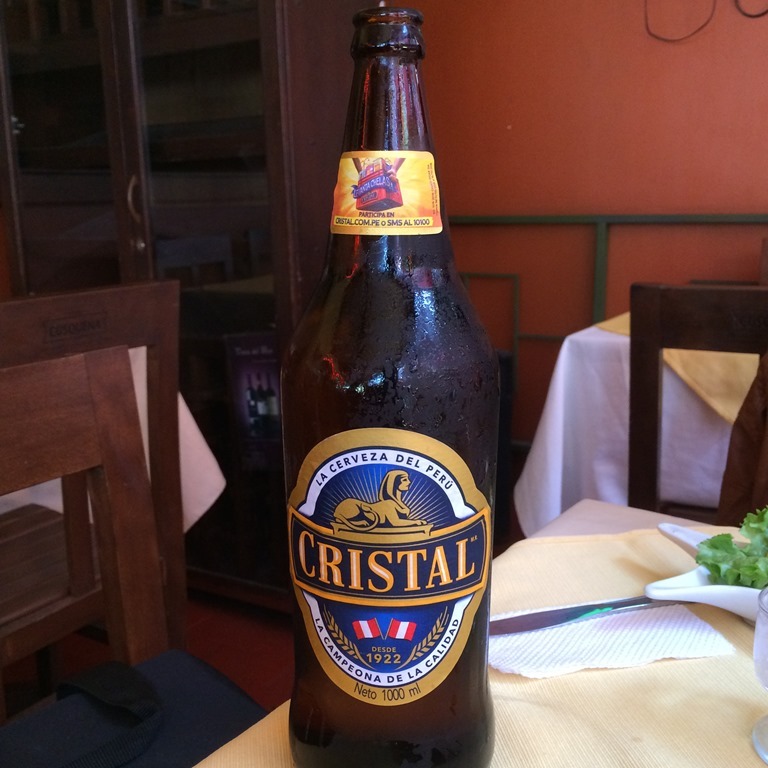 For drinks, we tried the Peruvian beer (Pilsen Callao, Cusqueña and Cristal) and the very famous Pisco Sour. 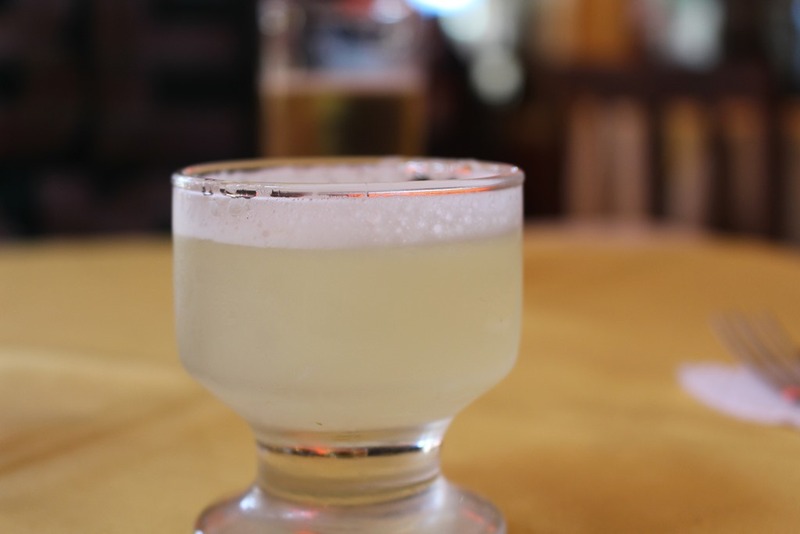 I preferred the touristy version of Pisco Sour to the original since it was little more mild and less sour. I am a total tea drinker, however in Peru I only had coffee. We looked forward to the breakfasts because of the amazing coffee they served. 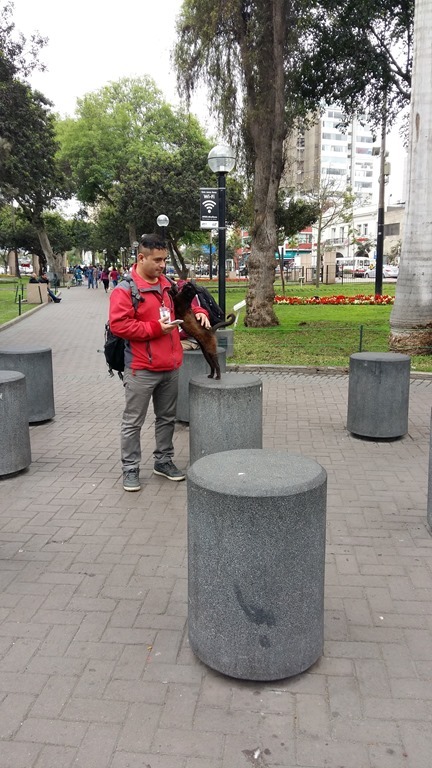 There are many historical places of interest in Lima. However we were in a mood to chill and just walk around the city. Hence didn’t visit any. For anyone who would like to combine the shopping and eating spree with some sight seeing, the trip advisor will be a good site to look up. 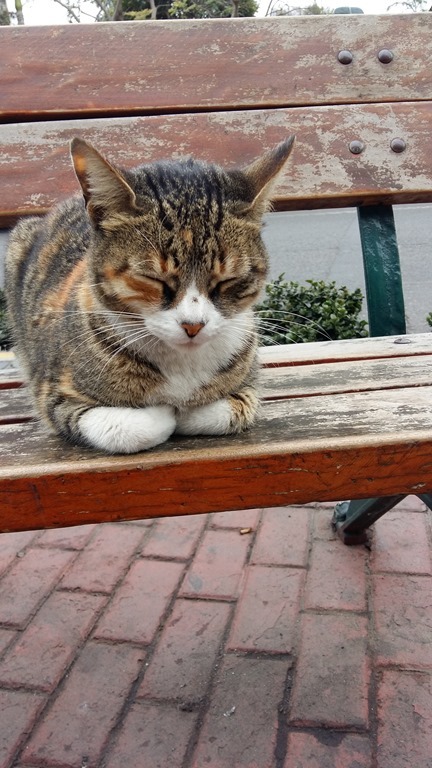 The only place we ended up visiting is the Parque Kennedy which gives shelter to hundreds of stray cats. Do read this interesting article on it. Rony broke his spectacles on the flight. So we had to get a new frame for him before leaving for Cusco. While doing so, we met Estevan at an optical store. Along with helping us communicate with the salesman, he gave us some amazing tips for the travel ahead. Thanks Estevan! While in Lima, if you are a fan of chocolates do visit the Choco Museo. It is a chocolate lover’s paradise. While Rony was buying a goodies to take back home, I clicked many pictures of the place. Its so artistically done up! From Lima, in order to reach Machu Picchu we had to fly in to Cusco and take a train from Cusco. Cusco gets rank 1 in the places we visited during the entire trip. 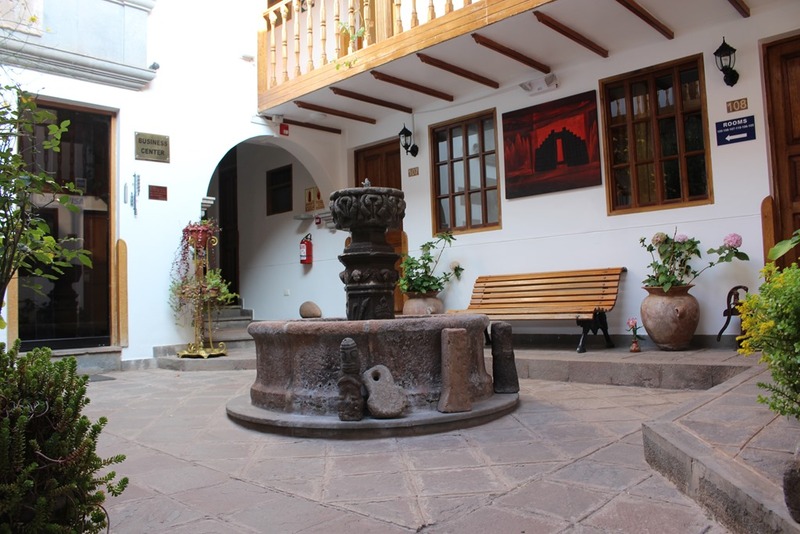 The cobbled streets, beautiful architecture and the amazing art galleries made the stay in the Cusco enjoyable.To be fair, when we planned the trip, Cusco was considered only as a stop over on our way to see Machu Picchu. 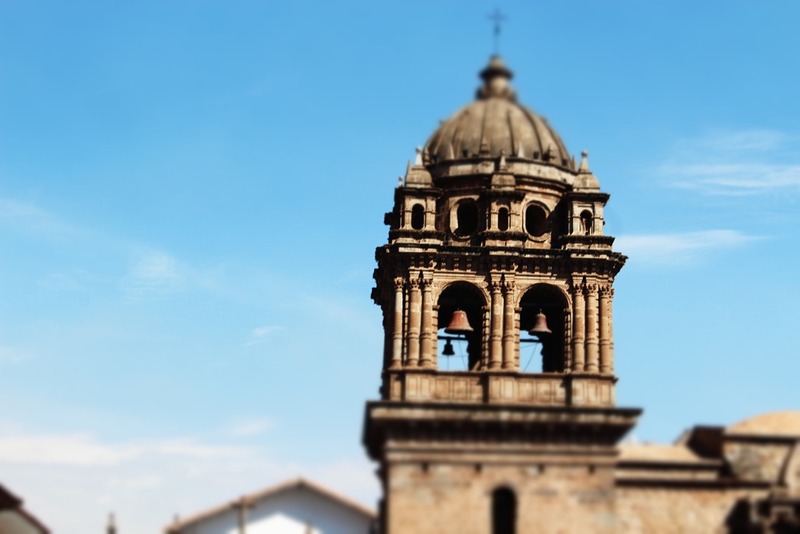 We didn’t know that Cusco as a city had so much to offer. 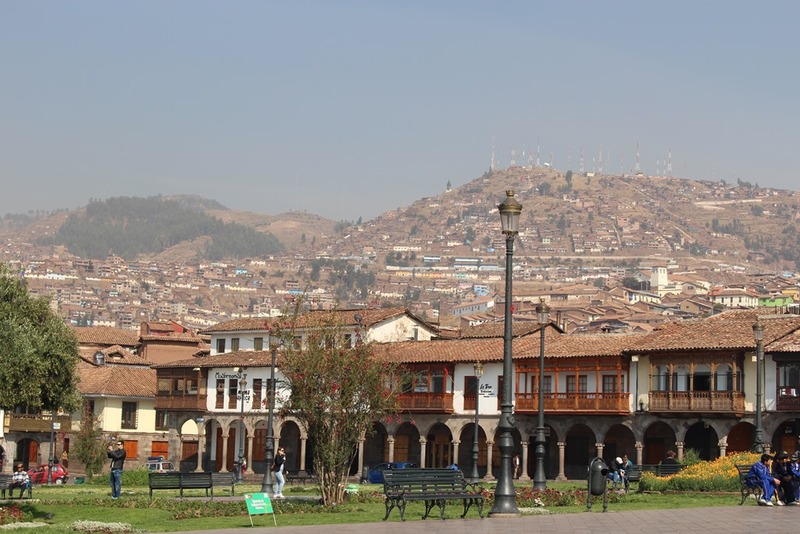 Since we were flying to a higher attitude most travel sites suggested that we stay a day or 2 at Cusco to acclimatize. We did so. 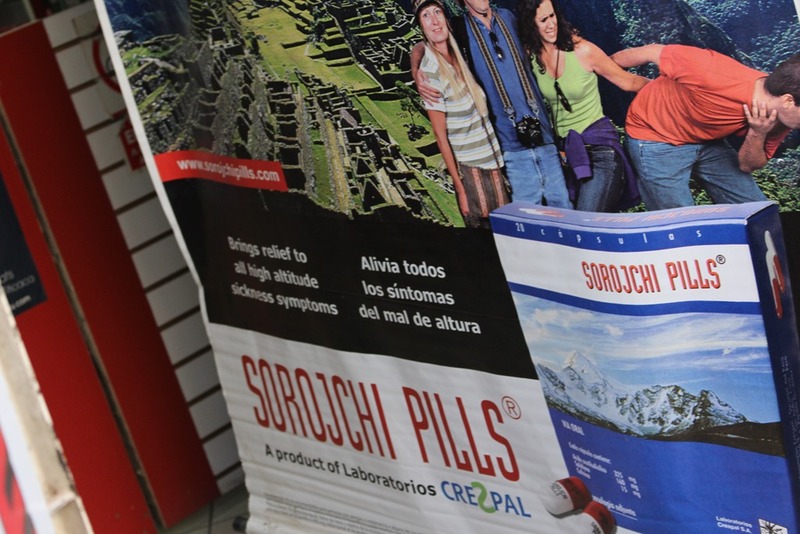 Estevan, the random friend we made in Lima asked us to carry a insect repellent and also take the Sorojchi pills. This did help us have a comfortable trip. The husband who had read about mosquito bites in Machu Picchu had carried an Odomos which worked perfectly! So as we saw other tourists buy expensive insect repellent we had a hearty laugh and thanked our very own Odomos for protecting us. 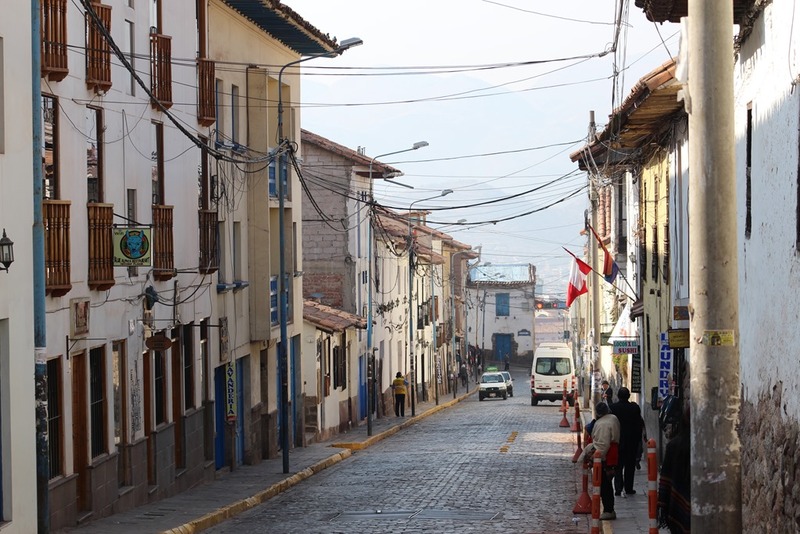 We hadn’t really booked any place to stay at Cusco till the last moment. Rony went through booking.com and found a hotel called Rumi Punku for our stay at Cusco. We couldn’t have asked for more. The pictures below say it all. An amazing room, excellent service and good location. We were received at Cusco the airport by David who then we realized runs a tour agency as well. He took us to the hotel and also helped us plan our itinerary for the next day. Though we felt we paid more than we should have, the guide (Leon) and driver (Herman) who took us around Cusco were excellent. We are people who prefer travelling on our own. But this choice was totally worth it. Leon who is a local, explained every site we visited in great detail. Because of the gamut of information we got from him, we did not take a guide in Machu Picchu the following day. We saw the entire site using guide book. 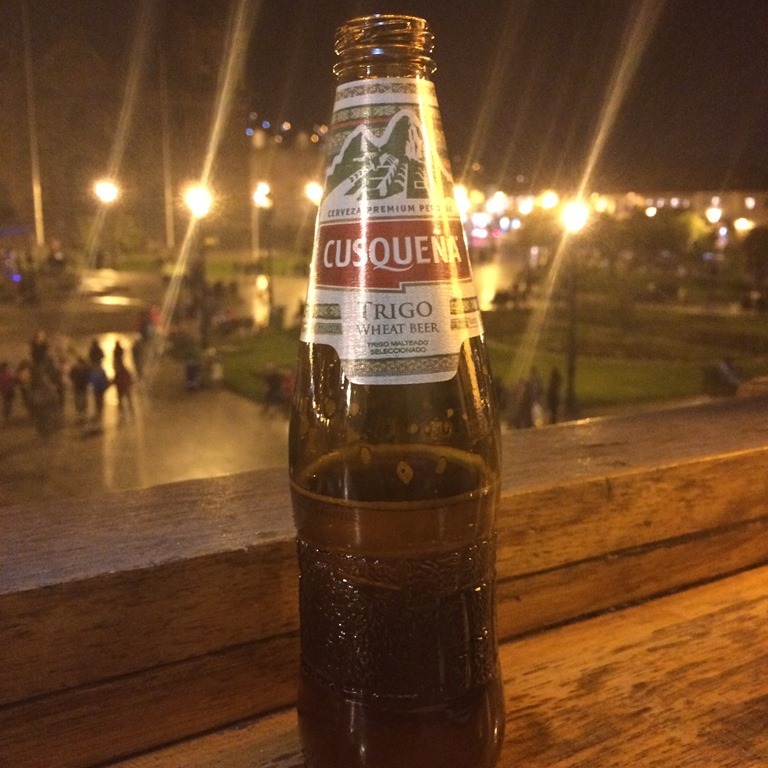 On the day of arrival at Cusco, all we did was chill, walk to the square (Plaza de Armas), drink some beer and eat some Llama. The next day after a simple yet filling breakfast at the hotel we were received by Leon and Herman Who took us to some Inca and pre Inca sites in Cusco. This is when we got to know that the Incan Empire extends beyond Machu Picchu. We bought a pass which gave us entry into number of places – The Boleto Turistico, however managed to see only a few. This was also because we took our time and did not rush to cover all the places. After all it does not make sense to see the place without experiencing it. Since many of the sites were vast and involved a lot of walking, I gave up at many points . Rony went ahead and saw it in great detail. I found a good spot to sit and clicked a lot of pictures! Each one of the places we visited deserves a separate post. But for now I leave you with some pictures clicked by us! After a long day of travel, we got back to the hotel, freshened up and stepped out for some food. On our way to the main square, we found some amazing art galleries from where we got a few paintings for our new home. Will post some pictures as soon as we have them framed. Cusco has an art school wherein students study art for about 5 years. The training they get in the school along with the amazing culture helps them create paintings which are a true reflection of the beauty one sees around! Since Machu Picchu is special and I have a lot of pictures to share, leaving it for the next post!